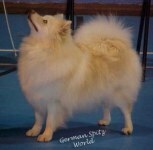 Scroll down for German Spitz breed Information and links to other German Spitz sites! 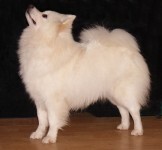 The German Spitz is an intelligent and lively breed, originally they were companion and watch dogs. 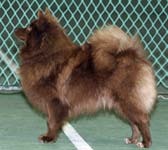 Developed from the larger European Spitzes they are miniature versions of the Keeshond and the Wolfspitz. 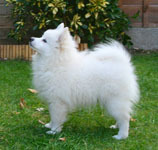 They were known as Pomeranians originally and became popular in the UK during the 18th century. 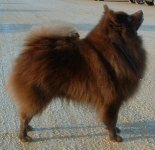 Miniaturised by the Victorians into the very small and highly popular Pomeranians that are seen today. In the late 1970s a few individuals began the move to reintroduce the original slightly bigger spitzes from the continent, they were recognised by the Kennel Club in 1985. There are two sizes recognised by the KC. All colours and markings are acceptable but butterfly pigment is not permitted with any colour. This breed make wonderful friendly pets. 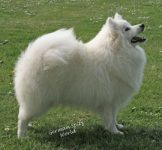 Even though the German Spitz has quite a heavy coat they do not need excessive grooming, an occasional bath, a quick brush every second day and a thorough grooming every week is fine. They do not need an excessive amount of exercise but will quite happily keep up on long walks, keeping that lively and intelligent mind occupied is important to prevent boredom with its associated problems.